A whole bunch of cute! 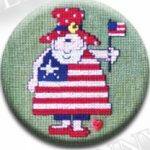 12 Delightful Santas to Ho Ho Ho with! Releasing 2 every other month, June 2018 starts with the title words and Santa placement along with July Santa. Don’t forget the Zappy Dot! 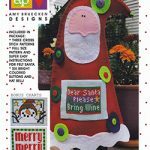 Included in package: 3 cross stitch pattern, full size pattern and super easy instructions for felt Santa, and 6 bright colored buttons and hat bell!